Building Your Future focuses on teaching the youth of Amador how to live a violence free life. We focus on a variety of subjects that teach respect, positive communication and prepare them for the future. 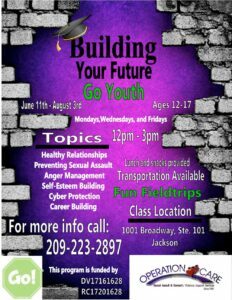 Lessons included are healthy relationships, preventing sexual assault, anger management, self-esteem building, cyber safety, resume building and mock interviews. Youth will be encouraged to participate in activities, fundraisers and community service. Groups are fun and full of energy and activity to engage youth and encourage participation. We want to provide youth a safe place where respect is the center of their experience. 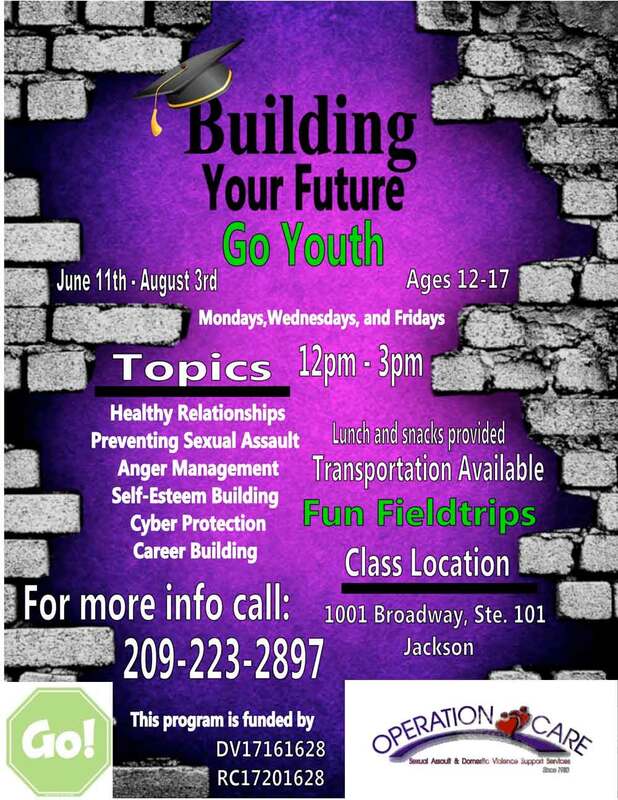 Go Youth Community Center located at 1001 Broadway Ste. # 101 Jackson Ca 95642. Classes will be offered from 12:00 pm – 3:00 pm on Monday, Wednesday and Friday’s June 11, 2017 through August 3rd. All of our programs are free and transportation is available upon request.